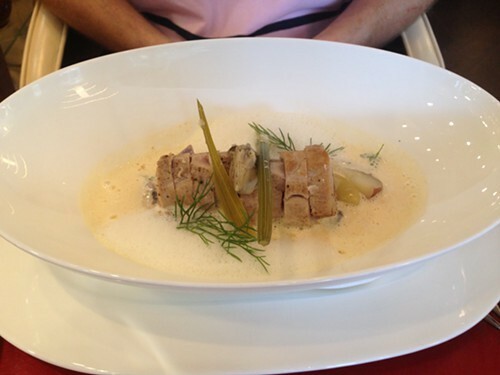 After leaving the Culinary Institute of America’s campus in Hyde Park, I called our Hudson Valley Restaurant Week lunch at Bocuse Restaurant “The Lunch of the Year” because it was different from any other lunch we had this year: very theatrical, French minimalist, and educational. After going on a tour of Bocuse Restaurant during the Hudson Valley Restaurant Week press launch in 2012, I knew I wanted to return one day with my husband for a special lunch. I was excited to find out that Bocuse was a participating restaurant because that meant a $20.95 prix-fixe lunch could me mine. (Their regular a la carte entrees are in the $18-$26 range). When I made the reservation by telephone, the reservationist made it sound as if I got the very last available seating for Hudson Valley Restaurant Week. So we really looked forward to that 11:30am lunch on Thursday. When we arrived there at 11:25 am there were only a few small parties seated. The modern bistro decor is very inviting. The maitre’d seated us right by the giant kitchen window near the bright ceramic roosters. I loved being able to spy on the hustle and bustle in the kitchen. It’s kind of like watching a chaotic scene in a silent film, but once in a while you hear a looming voice on the loud speaker barking orders about Table this and Table that. First came the selection of bread. (A French roll or sourdough. Real French butter was on the table). We were offered sparkling water. A young woman presented us with an amuse bouche, named “Lebanese Breakfast” a miniature breadstick with a mini pyramid. For our appetizer, I had the Black Truffle Soup, which Chef Paul Bocuse created in 1975. The presentation was triumphant. 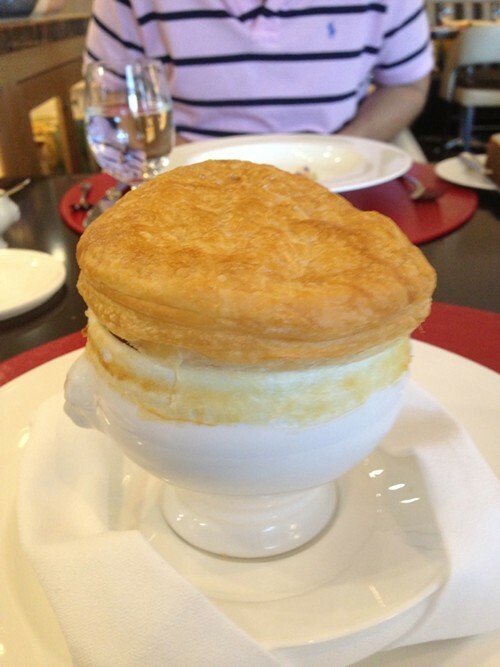 The best part of the soup was tasting the melted puff pastry at the very bottom of the bowl. Tom had the Warm Butter Poached Lobster to start. Very pretty presentation. The delicate lobster meat was different from any lobster I tasted. It was very soft. Serving size was minimalist, about the size of a finger, but delicious. For my entree, I had the Roasted Long Island Duck Breast. It’s been a long time since I’ve eaten duck. Few restaurants I go to offer it, and it is not the easiest meat to cook right. 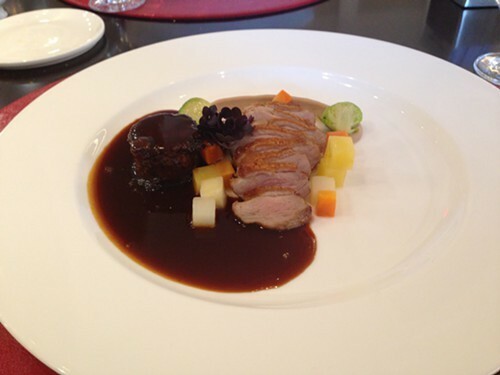 In this case, the duck was cooked to perfection, and the black currant sauce was incredibly tasty. While the sliced duck breast was delicious, I liked the shredded part even better. Tom had the Yellowfin Tuna. I tasted his, and it was very light. He went on and on about the fennel sauce, but I preferred my Long Island Duck Breast. I was happy for him! All the servers at Bocuse are CIA students who are close to graduating we were informed. Though I did sense a touch of nervousness at times, all the future chefs walk with confidence and appear so happy to be doing what they love. The service was exceptional. 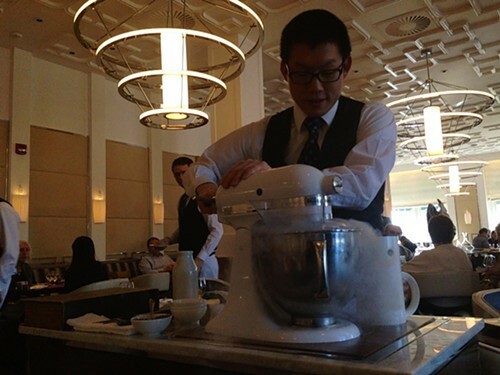 It is fun dining in a chef’s classroom. There were many different young chefs-to-be serving us. As we were enjoying our coffee, a young couple entered the restaurant with a baby, probably about a a year old. They sat down with confidence, and the baby barely made a peep while the maitre’d brought over a high-chair. I’m guessing the baby had a good track record of dining in fancy restaurants because he was so well-behaved as his mom and dad studied their menus. I hope his parents rewarded him with a little white coffee ice cream at the end. 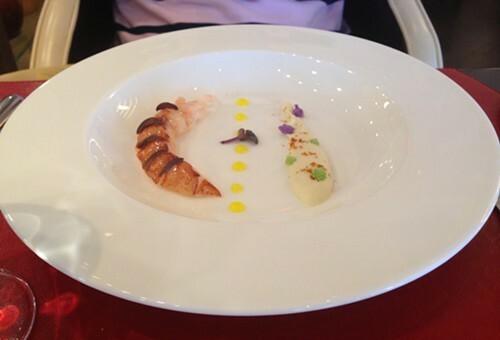 I’d recommend Bocuse as a perfect place to go for a unique dining experience. Follow Vanessa Ahern's Hudson Valley adventures at Hudson Valley Good Stuff, a blog about where to eat, play, and recharge your spirit in the Hudson Valley.